Welcome to the first of what I hope will be many Love List Project interviews. While I first envisioned doing these interviews back in December (I posed some questions in this post), the project sat on the back burner for a while. 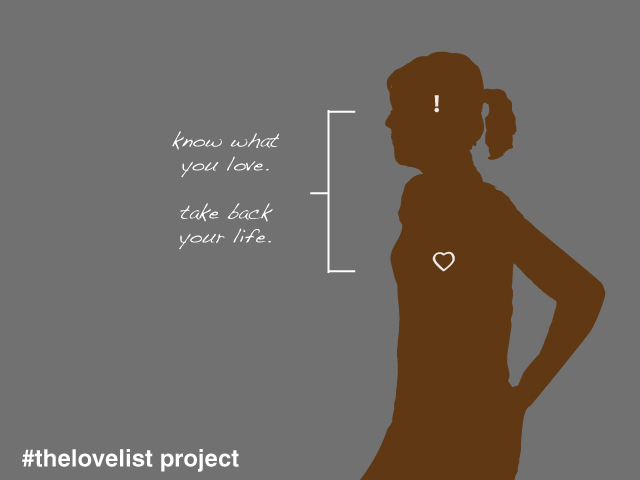 Now, my main goal in reviving the Love List Project is to share other people’s stories and voices. I’ve decided to publish interviews on Mondays, as a way to inspire us all to start each week thinking about what we love and why it matters. So please, get to know Julie Kennedy, who has a really powerful story to tell. May I invite y’all to my table? I suggest getting a cup of great coffee, tea, or a nice hot chocolate. That is what I’m doing as I enter this interview, because that is one thing I love when just talking and answering questions to dear friends about my journey. I wrote answers to these questions a few months ago, but recently a lot changed in my life. Almost a month ago I was outted by an anonymous person, who decided to call my parents to tell them I am gay. It has been a hard and crazy period. So much is different, but who I am and what I love is more true than ever, too. ~ Kristin: Think back to a time when your day-to-day life was markedly different in some way than it is today. What made it different? How did you feel about it? Julie: I only have to think back to just a little over a month ago. So much of my life then was random truth mixed with covering a side of myself. When I would go see my parents I would try to spend as little time as possible with them, mostly so I didn’t have to do some kind of word gymnastics to not reveal too much to them. I hated it, although in my mind it was what I had to do at the time. There was some joy in my life, but when you are hiding even one part, it feels miserable. I didn’t realize how horrid that tightrope was until it was taken away from me. I now have a t-shirt with a bird that says “Free”—I bought it shortly after I was outted, and nothing could be more true now. I am free now and that is what is different. ~ Kristin: Can you think of any pivotal moments, when you knew you had to change something negative or claim something important to you? What happened in that moment? Julie: A pivotal moment was when you [Kristin] wrote about something you had found, and needed to claim things you loved. I was in that same place. I was frustrated with working full time and going to university full time. My life seemed to be only about work and studying. When I read that post I realized I needed a new pair of “glasses” to look through. I needed to claim things that were good and promising about my life. I needed to find things that made me happy and in essence made me, me—to claim those things that make the working and studying, well, worth it. ~ Kristin: Have any major life decisions been impacted or driven by what you love most in life? When have you found yourself setting aside what you loved? Julie: I think this started within my first revelation I had when accepting me for who I completely am. My therapist at the time started drawing a tree. He looked at me and said, “I think it’s time we find what roots you.” As he drew the tree and made roots we started listing things that root me. Some were certain people, but also things that make me happy—things I like to do that bring me happiness alone. In those moments I started setting aside things I loved, and it made me confident within myself. This is when I began chasing my dreams, such as finishing my degree. I was realizing that there are things I do that are about claiming back myself, so that I can be happy within myself and do what I feel God has called me to do as well. I don’t mean that in a cookie cutter Christian way, but in a way that the decisions I make are exactly what God put in my heart to make me tick. Even in being outted this has become even MORE real. I am free—yes that again—to enjoy and claim even more of what I love. I cannot emphasize enough how important this is for me, or anyone! ~ Kristin: What does your life look like today? Better, worse or just different? What’s responsible for making it better/worse/different? Julie: My life is different today in that I work hard for things that matter most to me. There is no looking at others for how I should be (although I do look to others for help, maybe mentoring would be a good word). Some days I think things are better, other days they feel just worse, and other days they are neither, they just are. I’m learning to recognize when “worse” is just the lens I’m choosing to look through. That is what is good about the love list project—it stops you for a moment, to see what is right. ~ Kristin: What kinds of things have been showing up on your love list these days? Julie: What has mostly been on my love list are things that are connected to my job and things that are community oriented. This isn’t by accident. My job is a rough one, and sometimes I forget there are things it is teaching me. My students are unique in the lessons they teach, and to embrace them through the love list is an amazing journey for me. Since I have been outted, I can also add the crazy and wonderful friends who jump in and fight for you no matter what! I had a friend search for a spiritual leader to help me. Through that has emerged a new friendship, that seems to have been birthed in heaven. It’s an amazing, beautiful love list moment I wish I could get more in depth about! ~ Kristin: How might you make real changes in your life, based on what you love? Julie: I find that I’m pursuing things that go with what I love. I have hit a bump in the road in this, and it has been frustrating, but I still find myself driven to do things that match what I love. I love bridging people, I love being an activist for those who cannot speak for themselves, and the list builds from there. In other words, my love list has pushed me to go beyond the surface things, and to do things that truly make a difference. ~ Kristin: Do you have any wisdom or advice to share with others? Julie: I would say don’t give up. I have gone through a week of disappointments and what seems to be a failure. It is important to find those moments that drive you to things you love. I personally have found by pursuing what I love, I can impact people around me without that empty feeling, or feeling that my energy is zapped. Look in the places you think cannot hold things you love. Things you love that can help you recapture your life are sometimes richest in the place you think is a pit of darkness. Put on a new pair of glasses that allow you to see things you never thought you would before. I first realized this before I was outted, and I am even more passionately standing behind it now. Guys, please, grasp wherever you are in your life and see that you can find that love list moment even in the middle of a full-on mess. Oddly, it is there. Julie Kennedy is @MoJoJules on Twitter, and her blog is The Wonderer. Wonderful … and thanx to Julie for inspiring us all to look more deeply at what we love. The darkness, the shadows can quickly overcome us if we let them. I make it a weekly practice to sit down and add to my love list. And, daily … the things I love (I discover knew things all the time!) always find their way to my camera’s lens. It’s early yet but I’m praying for the day you can look through the glasses of forgiveness and replace the word “outted” with the word “freed”. AMEN Jules… the greatest of these is love!